Ski Lodge on Fri 30 Nov.
Lodge du Village on Tue 11 Dec.
La Taiga on Th 13 Dec.
Milder weather, but prepared pistes holding up well lower down. Folyeres skiable down it’s entire length for those prepared to hike up. Great skiing in Val Thorens and fresh snow high up, lift companies working hard preparing pistes right across the Three Valleys. 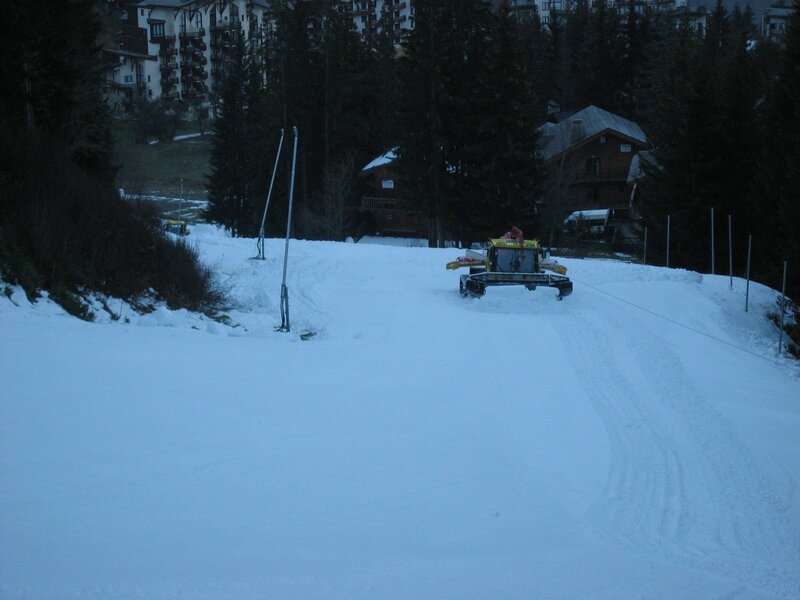 Further bashing at 4.30 today of Folyeres which is skiable all the way down to the gondola and still more than 2 weeks to the opening of La Tania. View from corner of Arolles piste looking down on to the snow cannon reservoir. Only half full as they have made so much snow, mounds up to 4 metres high! The last chance. . ! Beautiful sunny day, over 35 cms of powder, freshly pisted, no body about, what perfect conditions. 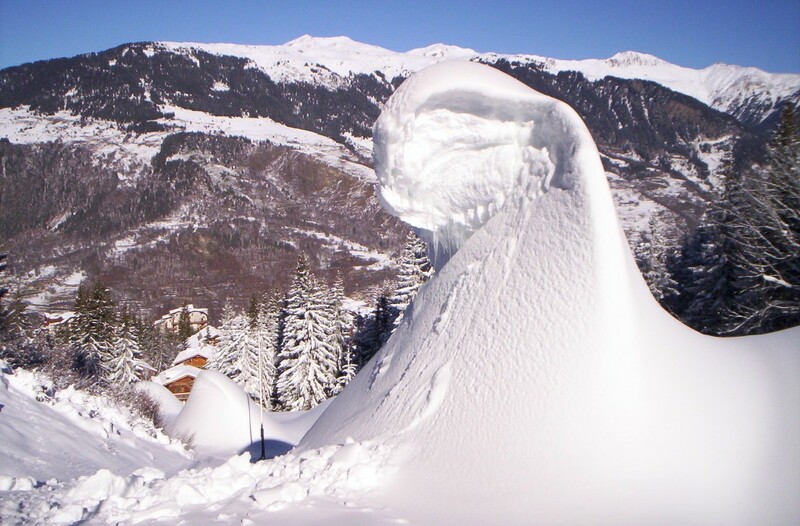 If only the lift was open…..
Another amazing snow mound created by the snow cannons – can’t remember seeing them this big before, and they’re all the way up Folyeres. Thanks to Mutzig Dave for the pic. 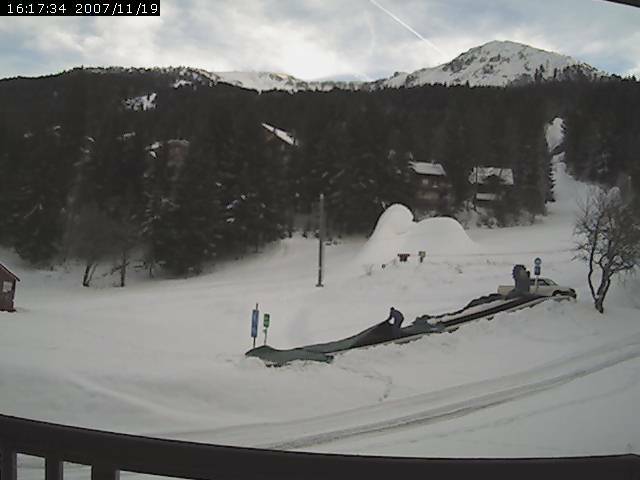 The kids beginners lift, the moving "magic" carpet has been serviced today and still the snow cannons blow. Amazing size mounds of man made snow continue to lie all the way up Folyeres to the top gondola station. A huge one here in the middle of the piste waiting to be flattened by the army of piste bashers.